Whether you need to quickly shred a large block of cheese for your brick oven pizzas, slice potatoes for frying, or grate parmesan for sprinkling over fresh garden salads, this Tablecraft SG205BH 9" four sided heavy-duty stainless steel box grater is sure to quickly do the job. What's more, each side features a different type of grater. The teardrop shaped, extra coarse holes are used for shredding cheese into larger pieces while the medium ribbon holes are for shredding cheese into finer pieces. The slicer is perfect for vegetables and the side with the outward protruding holes is used for fine grating. Well, I had to wait to do a review until I used this grater. I have to say that, for the price, I thought that it would be made of a flimsy metal and not very sturdy. How wrong I was! This grater is first class! The handle is very comfortable for someone with problems holding objects or with arthritis. The rubber at the bottom keeps it from slipping on the counter or cutting board. It's also removable for easy washing. Each grater side is sharp and well angled. I used it for zesting and grating cheese and carrots. I was very impressed. This box grater is definitely heavy duty. Nice, thick, stainless construction with a non slip handle. The rubber ring around the base is great for keeping it from sliding around, and it's removable to make it easier to clean. Very sturdy and heavy duty. No complaints here. All side works and easy to clean. The handle is very comfortable even when grating five pounds or more. This is a great product. I like the rubber on the bottom so it doesn't slide when grating. The greater is sharp and so easy to easy. This is a solid, compact grater. Four different hole sizes make it versatile for everything from cucumber and cheese to garlic and ginger. I don't use a microplane enough to justify having one readily accessible, so this replaces that tool with ease. Solid grater, sharp edges, and it stays on the counter nice with the rubber feet. The first one arrived dented, which is kind of annoying with a grater since a nice flat surface works best. But customer service is amazing and they sent out a fresh one immediately. great cheese grated for quick smal jobs. we use it for cheese and carrots only. easy to clean and very sharp. i would reccomend this. We lost our old grater that was much larger and bulky. This one is more compact with nice big holes for grating and the rubber foot makes it so much easier to use without it slipping on the board. Makes shredding large quantities of block cheese very easy. The 4 size options to grate range from fine to coarse depending on your needs. Its nice that whatever you grate stays within the box. I like this multitasker grater because I have 4 different ways to grate all in 1 piece. Very sharp blades and easy to clean with a brush. Heavier duty than what’s available in the stores. Held up to grating over 20#’s of gruyere without bending the handle or pressing in the sides at all. This 4 sided box grater from Tablecraft is awesome! It doesn't slide around, has 4 options to choose from for your cheese or vegetables, and is dishwasher safe. The tablecraft stainless steel box grater is great and perfect for grating fresh carrots for our muffins. The grater is strong and does an excellent job. This 4 sided heavy duty stainless steel box grater Works perfect for when we have to grate our FRESH mexican cheese at our mexican restaurant. The Tablecraft grater is a good deal for the money. The rubber foot stabilizes it during use and it does exactly what it is designed to do. And, I would buy this again. That's the best compliment I can give this product. This grater is an excellent choice for a home or commercial kitchen. It's great for anything from a small fine shred to larger pieces of carrot. This shredder is well made. The rubber grip on the bottom is helpful so that shredder doesn't slip. All four sides of the shredder are useful. A nice quality 4 sided heavy duty box grater that is perfect for shredding cheese. It is also a dream for grating carrots and zesting lemons. Awesome grater! 4 sides to choose from so you can use a variety of cheeses or vegetables. Sturdy, nice handle, rubber bottom so it stays in place, and stainless steel. We appreciate your review, Mary! We are sorry this box grater did not meet your expectations. If you are looking for a different product that will better suit your needs, please contact our Customer Solutions team. This is indeed a heavy-duty grater! The rubber footing easily holds it into place as you grate cheese or carrots. The holes are sharp making it take no time to get the job done. This is a high-quality cheese grater for the price. Four sides let you slice or shred your cheese. Sturdy metal construction with a rubber base and handle makes it easy and comfortable to use. i used this to grate a whole bunch of cheese and it worked great, quick and easy. the gripped footing and handle make it easy to hold on to and it grates with ease. Standard stainless steel box grater. Works well, I do likethe rubber base that keeps it from shifting while in use. The handle is ok but could be better for times when you are grating for a while. Very easy use and works well. We primarily use it to grate cheese and have been very pleased with the quality. We would buy this again! This box grater is great for the price. It truly is heavy-duty and saves multiple needs with various grating options. Like any box grater cleaning is not the easiest but I've learned to overcome that. Sometimes you are only grating a small amount of something or someone else is using your larger one (the wife). This works very well and stores easily inside the larger one. Buy both. You deserve it. A great and sharp grater that grates cheese and vegetables in no time. Easy clean up and very sturdy so it does bend when pressing down firmly. This is a really good quality cheese grater. My staff really likes the non-skid base, it makes shredding large amounts of cheese quicker and easier. This heavy duty, stainless steel grater box is every kitchen gadget. Each side is every sharp and sturdy. Love the rubber foot stand so it wont move when using. The grater works excellent but I'm not a fan of the rubber gasket on the bottom. It traps food and makes it a bit harder to clean, I threw it away. This is a great, sharp grater. It has a very basic design, but gets the job done. The rubber grips on the bottom prevent any unintentional movement. This is a super durable stainless grater and it is by one of my favorite brands: Tablecraft! I can't say enough good things about this brand. 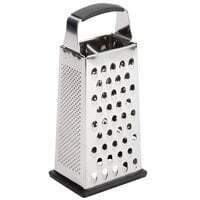 Very sturdy grater, I mostly use the cheese side, its heavy weight and sharp. Grates even frozen cheese with not much effort, I would definitely buy this again. This grater is heavy and very sturdy. I prefer to set on flat surface to finely grate for our baked goods. We use for many ingredients from finely grating carrots, coarser grated cheese to quickly making citrus zest. Does the job. It's a good quality food grater. It's good for many things including grating butter that was chilled in the freezer for a pie crust recipe. I guess you get what you pay for. The welded areas snapped apart, rendering this pretty useless very quickly. The grater slips out of the rubber base as well. Thank you for the feedback on this grater. We wish it would have worked out for you. A Customer Solutions Representative will contact you about this shortly. Pretty good grater for the price. It seems pretty standard, but I really like the rubber at the base. It helps a lot if you're resting it on the counter. Very sturdy and easy to clean. Comfortable grip and the many size options are very nice. It has lasted a long time in our kitchen. This is a really nice grater. It's not flimsy. It holds up well after many uses. We purchased two of these for cutting our home style potatoes for breakfast. This grater is amazing! The rubber base on the bottom helps it from slipping. It is very heavy duty and excellent for everyday use and very durable. I really like this grater so far. It is very strong and easy to use. The handle has silicone and that helps grip the grater better. Very sharp and easy to use. This is a great box grater for the price. It has a rubber bottom edge so the grater doesn't slip while in use. The largest holes are really large! A great grater. A kitchen classic! The rubber footing on the bottom is useful and after a few months of use the blades are still sharp. This is an awesome box grater! Very sturdy and the rubber pad on the bottom prevents slipping. I am very pleased and would recommend to others. Product came as described...heavy duty box grater. I needed a replacement after my old grater with plastic handle finally cracked. This stainless steel grater should last a long time as the construction appears to be pretty good. The price is excellent too!